Wireless Site Surveys for WLAN, WI-FI wireless networks in Milwaukee and the Wisconsin Area. With a Wireless Site Survey in Milwaukee ask about our Free Cisco Router or Access Point Promotion. Are you or your organization contemplating “going wireless?” If you are then you need to understand the importance of having a Wireless Site Survey performed to optimize Wireless Access Point placement and ensure cost efficiency. WLAN site surveys are an extremely important part of designing an 802.11b, 802.11g or 802.11a Wireless Lan Infrastructure. Wiscomp Systems utilizes a unique approach when performing Wireless Site Surveys. Our engineers use a combination of a computer generated survey (Airmagnet), multi-job experience and manual methods to provide the most accurate and relevant results that you, the customer, can easily interpret to provide the best WLAN design and deployment. You will be provided with computer generated results of the survey along with a portfolio of digital photographs and Wireless recommendations. All Wireless Network Installations are not the same. While one antenna or access point may work in one situation it may produce undesirable results in another. WI-FI surveys enable the wireless installer to pinpoint what types of wireless antennas to install (omnidirectional, patch or yagi) and what Wireless Access Point to utilize (integrated antenna, external antennas, 802.11a, 802.11b, 802.11g, indoor, outdoor). Take the guess work out of installing a wireless solution and let Wiscomp Systems design a secure, productive and accurate WLAN network. How site surveys work. 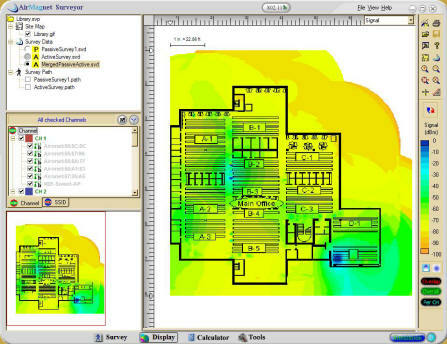 In a typical site survey Wiscomp Systems will import a floor map into the Airmagnet Surveyor Pro software. Then utilizing the ideal Wireless Access Point and Antenna combination, Wiscomp certified engineers will physically graph out the signal strength, noise level and data rate for each test placement location. This Wireless walkthrough provides accurate data and pinpoints proper Access Point placement and the radio coverage that you, the customer will need for an optimal performing Wirelsss LAN Infrastructure. This procedure also indicates where Wireless Cell boundaries are and where data rates drop so that seamless Wireless Roaming can occur along with acceptable packet loss statistics. This results in a properly configured WLAN design. The alternative to performing a site survey is to guess where to place the Wireless Access Points and Antennas. This almost certainy results in poor coverage, disjointed Wireless Roaming, massive "Dead Spots" and an otherwise unsatsfactory WLAN network installation. This may also lead to an over-engineered Wireless LAN Installation where too many costly WiFi access points and antennas are utilized without any overall increase in performance and worse yet, a WiFi natwork that interferes with itself. Wiscomp Systems utilizes Airmagnet’s powerful WI-FI (WLAN) site survey tool . Airmagnet Surveyor collects and analyzes radio frequency (RF) data that is analyzed by a wireless installation professional for optimal WLAN deployment and planning. Airmagnet collects such important WIFI data such as; signal strength, data rate, noise level, channel allocation and user density. This data allows Wiscomp to make an informed decision on how to implement, design and support a Wireless Infrastructure. Please take a moment and fill in the brief form below. A Wireless Site Survey expert will contact you shortly regarding your potential Wireless Project and see how we can help.